It’s so exciting that we’re finally just a week away from the event that we’ve been waiting for for so long. 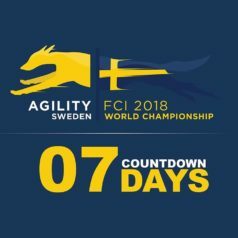 It’s the first FCI World Championships held in Sweden and I think it will be one of the best ever. Swedes are good at organizing and I know that the committee has put a lot of both thought and work into the event. 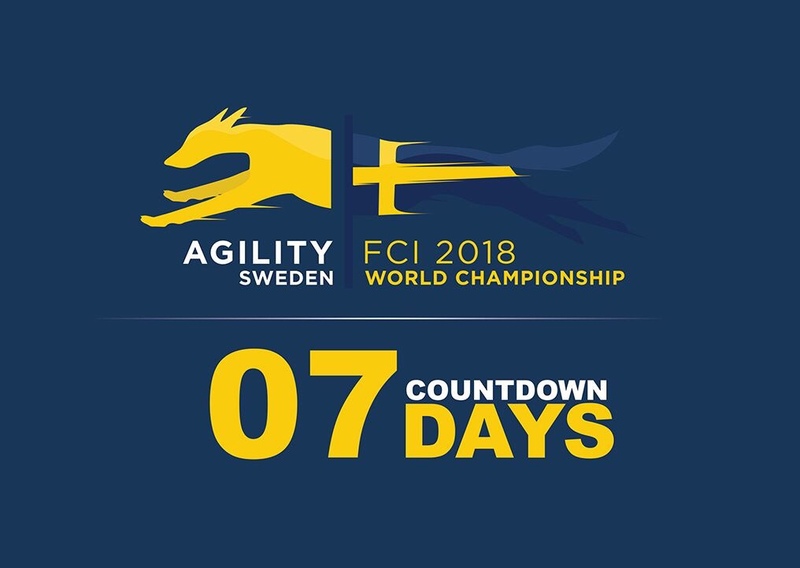 I’m excited to once again see some of the best agility in the world, get inspired and find new challenges for my training, and to meet friends from near and far that have come together to experience the championship live. I’ve visited many world championships. My first was in Norway in 2007 when I lived there, and it was such an amazing experience that I wanted to do it every year. My trips to the AWC has not only been an agility experience – it’s also been a way for me to discover Europe and get a few days of vacation with good food and friends. I’ve been to Finland, Austria, Germany, France, Spain, and twice to the Czech Republic. One of the things that I really love about agility is that it is such an international sport. At the AWC, you’ll find competitors and fans from countries like Japan, China, Brazil, Colombia, Venezuela, South Africa, Canada, the US and this year even Australia. The championship is not only big and international when it comes to competitors, it also draws more spectators than championships in other sports. There’s something very special in watching your favorite sport in an arena with thousands of other fans. There is, however, something that makes the decision to go harder every year. It’s both time-consuming and expensive to travel to another country to experience agility and you can actually experience the championship from home. Some years I’ve stayed home and watched the live stream instead. I still take the weekend off and immerse myself completely in the competition. But I can still hang out with my dogs and do some training with them or take a walk during course building and course walk. I think this is what I’ll do next year unless I get the honor of running in the Swedish team with one of my dogs. This year, I’ll definitely be in Kristianstad for the big event. But I’ll still be part of the live stream. I will be one of four commentators on the live stream and work every other class. It’s an important job and I’m actually quite nervous about it. I’ll try to get all the facts right, not mispronounce names terribly, and give you a feeling of excitement and drama. So if you can’t make it to Sweden this time – make sure you purchase the live stream and hang out with me next week! Here’s the link to the live stream page. And if you are coming to Kristianstad next week – please say hi! I’m looking forward to seeing both old and new friends at the event. A good, steady sit is a wonderful thing to have when you’re training or competing with a dog. It’s one of the first things I teach my puppies and something I keep working on for my dog’s entire career. It makes so many things clearer and easier in training and gives you an advantage in competition when you know that your dog will sit perfectly still until you give a verbal release. It is actually a quite simple behavior to teach. Problems that arise are usually because of either lack of clear criteria or lack of a clear verbal release. I think the clearest criteria for a sit is that not feet move. The dog is allowed to move his head, but not lift any feet off the ground or shuffle them around. This criterion applies all the time, even when I’m close by and about to reward. Many dogs will start to lift their feet as we get close in anticipation of the reward. When we then reward, we reward the foot movement and muddy criteria. To make sure this doesn’t happen, I do all of my initial training at an arm-lengths distance to make sure that the dog will keep still when I reward. I use a very high rate of reinforcement, which gives the dog very clear information on what you like – and what you don’t like. Since I reward so often, it’s obvious to the dog when reinforcement stops and he will quickly realize what doesn’t work even if I don’t comment on it. It’s easy to progress once the dog is perfect at a close distance. I’d like to say that 90% of the work is done there, so don’t try to get distance or duration at this stage. You should be able to reward from any angle and at any speed, without the dog moving his feet, before you move on. I don’t use any cues at this stage. The dog will make mistakes, so I don’t think it’s useful to use a “sit” cue, and I don’t think it’s necessary to use any verbal feedback on right or wrong since the rewards to the talking for you. You can add some praise in later to make increase difficulty in staying when the reward is presented, and you should definitely praise when the dog releases on cue. Add a verbal release cue from the very beginning. A verbal release means that the dog moves out of the sit on a word from you. The word should not be depending on any motion from you to work. It’s so much easier to add with a puppy or dog that has no concept of a wait, because you know that the dog will move before long if the reinforcement stops. If your dog is already dependent on your motion to get out of the sit, you need to stop that immediately and find a way to get the behavior without any movement from you. Usually, it works to just give the verbal release and wait for the dog to get up – even if it takes a few seconds. As soon as the dog moves, you can move and reward. For the more extreme cases, I’ve sometimes just worked on getting an offered release – without rewarding the sit at all – and rewarded that until the dog offers the behavior from a sit repeatedly. Then I’ve added the cue just like I would to any new behavior I’ve captured or shaped. The most difficult part of this is usually handler mechanics. A lot of trainers are not aware that they move every time they give a verbal release. Since dogs are so much better at reading our bodies than they are listening to what we say, they usually just respond to the motion and never really learn to release on a verbal cue. 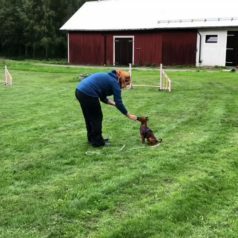 This does not only lead to a lack of response to the cue but also leads to the dog guessing when to get up based on movements from you, which leads to broken startlines in agility and other problems with stays. Using a video camera to check your own mechanics is a great tool. Are you moving when you give the release word or do you wait until the dog moves before you initiate the reward? Here’s a video where I work with a bouncy, enthusiastic miniature pinscher that doesn’t know a stay or a release. I do some talking in Swedish, but there are English subtitles – click the CC button at the bottom of the video if they don’t launch automatically. Let me know if you have any questions on this topic!